Home › 24 Pink Magnetic Push Pins - Perfect Magnets For Maps Whiteboards Calendars A..
24 Pink Magnetic Push Pins - Perfect Magnets For Maps Whiteboards Calendars A..
Set of 24 pink magnetic push pins. Ideal for holding items on Filing Cabinets, Whiteboards, Bulletin Boards, Magnetic Maps and Refrigerators! Dimensions are 11 mm diameter by 17 mm length. Small magnets hold up to 6 pieces of paper with a single magnet! 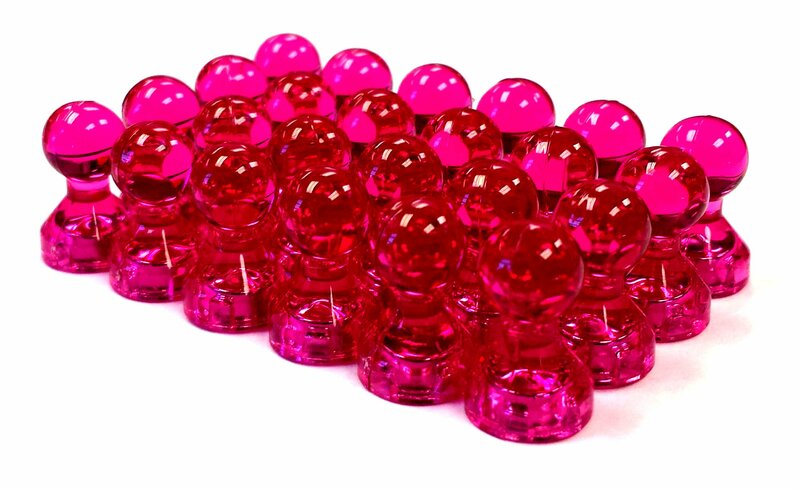 Color: Pink Set of 24 Pink magnetic push pins, pawn style. Dimensions are 11 mm diameterby 17 mm length. Perfect for hanging papers directly on any magnetic surface(except glass). This magnet set complies with the regulations and labelingrequirements of the Consumer Product Safety Commission. In addition, inaccordance with Amazon strong magnet policy, these magnets are not strongmagnets because the exposed portion of these magnets all have a northpolarity, which allows the magnets to adhere strongly to metal but have a weakconnection to each other (flux between magnets is less than 50 kG2mm2).